With over $12 billion dollars in new mining projects coming on board and likely to proceed (Business News Western Australia, May 7-10 edition) – and stable commodity prices – things are looking up for the Resources sector in Western Australia. Resources companies in Western Australia and elsewhere will be working through plans to extract precious minerals from their operations, which typically involves years of exploration drilling by carving a narrow grid of tracks through the outback bush land, with the rigs drilling small regularly spaced holes to see what rock types exist below the surface. They analyse the rock samples and map their findings, and refine their search – eventually honing in on a deposit. Once and ore body is properly defined and mining is to go ahead, then the haulage roads, infrastructure and accommodation camps are put in place so extraction and processing can begin. Why is an environmental technology consultancy blogging about open pit mines and exploration activities? Well, if you work in Western Australia or another mining hub in the world, you will know that one of the greatest positive impacts you can make on the environment is to help mining companies achieve best practice in environmental management. Western Australia have some of the most comprehensive environmental protection regulations in the world; and while mining companies are subject to environmental approval conditions and regular reporting, Gaia Resources provides an important service in helping them collect, manage and make informed decisions on their environmental data, and help them manage the land they are custodians of. Once you strip back all the technology and data considerations, what this is really about is giving companies information based on solid evidence. This can get pretty tricky in areas where decades of exploration activity has occurred – and so a GIS overlaying several layers (drilling collars, tracks, georeferenced plans, rehab data, multiple years of imagery) becomes very important to develop an accurate picture. So how can we meet our core goal of supporting those that work with the environment in this space? For many years now Gaia Resources has been working alongside mining companies to map and analyse ground disturbance in support of their MRF (Mine Rehabilitation Fund) reporting and AER (Annual Environmental Reporting). We’ve blogged about this topic in previous years (2013, 2014, 2016, 2016 again, 2017) but have been involved in this work since 2005. In fact we are just finalising this process for another new client (we’ll release a project update on that soon). 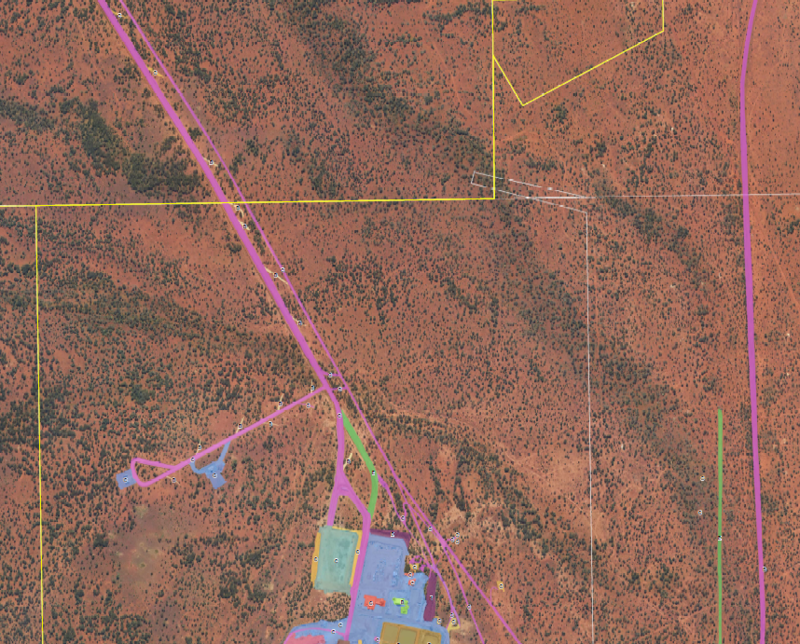 Ground disturbance mapping in the Goldfields of Western Australia. Disturbance mapping is a multi-year process – in year one we acquire aerial or satellite imagery, and create a benchmark dataset of cleared or disturbed land within the tenements held by the mining company. Then subsequent years is about monitoring change by adding new disturbed areas, and noting where rehabilitation works have been done. The aggregated areas (of clearing and rehabilitation) are reported per tenement to calculate MRF bond deposit levies on the regulator‘s system EARS2; but also to compare clearing against Programs of Work (there’s another DMIRS system to manage that process) and against any specific environmental approval condition limits. For the disturbance mapping to work across several years it is important that we process the imagery to match up perfectly, to avoid under- or over-estimating cleared areas. We also make use of powerful GIS toolsets in QGIS to work efficiently across large tracts of land. We also help mining companies assess the health of their data management practices and implement technology change to improve timely staff access to spatial information. For mining companies this is often about establishing a ‘single point of truth’ for important spatial datasets and treating those sets of information as corporate assets – with on-going maintenance, ownership and accountability – rather than just a means to create maps. We also look at the data life cycle – how the organisation collects spatial data in the field, how they use it in their business processes, and its value for re-use. We then spot technology opportunities like mobile mapping software, database upgrades and automated data processing packages to increase data quality and accessibility. All this means that the mining company can not only be more efficient, but they can more adequately and defensibly manage and protect the important environmental assets that are potentially impacted upon by their activities. Gaia Resources also do some important work with Not For Profit organisations who partner with mining companies to implement regional and community strategies for threatened species and natural resource management. For instance, we help the Great Victoria Biodiversity Trust to analyse a range of Goldfields data layers and develop survey locations for Malleefowl monitoring (see previous blog). The in-kind support provided by mining companies (e.g. IT resources, transport and accommodation) supports environmental management research and programs. On the other side of the coin, we also do work with regulators like the Department of Biodiversity, Conservation and Attractions, and the Office of the Environmental Protection Agency to streamline the spatial data management side of their environmental approvals processes (here’s another link to a blog on that topic). The bigger picture – working with miners, regulators and NFP partners to conserve habitat for the likes of the Malleefowl (right) and understand cumulative environmental impacts. This is all about the bigger picture for us as a company. We are looking for win-win situations that minimise the collective footprint on the land and conserves fragile ecosystems. Mining companies benefit through streamlined data management and visualistion, and richer information products to support their core business activities. We think it’s important to put our efforts into areas where we can make a difference – ground disturbance, data processes and technology and supporting not-for-profit programs are key parts of achieving our corporate goals. If you want to talk to us about ground disturbance or environmental regulations, then drop me a line at chris.roach@gaiaresources.com.au, or start a conversation with us on Facebook, Twitter or LinkedIn.